The Welsh National Opera (WNO) recently brought their newest opera performance, Eugene Onegin, to the Liverpool Empire Theatre. 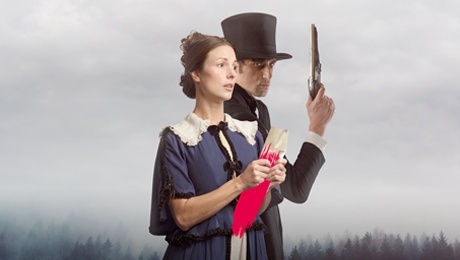 Originally written by Pyotr Ilyich Tchaikovsky, and first performed in Moscow way back in 1879, the focus of Eugene Onegin is the character after which the show is named. Tatyana, the daughter of Madame Larina, happens to meet Eugene by chance, as he visits her house alongside his friend Lensky, who happens to be the fiancé of Tatyana's youngest sister Olga. Having been in the process of reading a romantic novel, Tatyana soon realises that she has fallen in love with Eugene, and after telling their home nurse Filippyevna that she cannot sleep about her feelings, she sits up all night writing a letter to Eugene to express her love for him. However, when Tatyana sees Eugene again, he makes it clear that he is not interested, being unsuited to marriage and advising Tatyana on how to express such feelings in the future, which breaks her heart. It becomes the talk of the town, including at a ball for Tatyana which Eugene attends. As a reaction, Eugene tries to dance and flirt with Olga, much to the disgust of his soon-to-be-hitched friend Lensky. A verbal confrontation between the two friends shocks everyone at the ball, and ultimately the stage is set for a duel. But while Eugene comes out on top there with a gunshot, the killing of his best friend weighs heavily on Eugene, as does the fact that the subsequent years are irrelevant within his life, convincing him to go home. By this time, though, things have changed. Tatyana has now matured, both physically and emotionally, and of particular note, she is now married to Prince Gremin. Eugene is shocked to see how Tatyana has changed, and Tatyana is even more overwhelmed when she spots Eugene. Eugene realises that he does now have feelings for Tatyana and tries to tell her by visiting her house, but it's clear that he will not get what he wants. Although Tatyana admits that she still loves Eugene, she emphasises that circumstances would not allow the two to be together, and ultimately as the show ends and Eugene breaks down in tears, he realises that his own character flaws and misguided decisions have led to him being alone as opposed to the lady who once expressed her love for him. As is the case with WNO productions, the opera singing is of a high standard, which of course carries the dialogue and much of the acting. Natalya Romaniw is very impressive as Tatyana, and her vocal renditions are probably the strongest across the show as a whole. But Nicholas Lester also does a fine job as Eugene, going from the unmoved, almost-emotionless character of the first Act to the psychologically-fragile, weakened man of the final Act. The settings are absolutely stunning: though the Acts have short breaks as scenes are switched around, it is worth it when you see the lavish surroundings of Madame Larina's ballroom, the ice-cold backdrop for the duel between Eugene and Lensky, and in particular the noble architecture that recreates Prince Gremin's palace. True opera fans will recognise the songs, and for those who do not (bearing in mind that the entire show is performed in Russian), a handy screen showing English translations is situated above the stage. In terms of downsides: the show lasts almost 3 1/2 hours from start to finish, which is incredibly long. This includes two intervals and several mini-breaks for scene changes, but I felt that it could have been trimmed down significantly; removing the second interval, which takes place around 150 minutes into the performance, and shortening the second scene of Act 1 where Tatyana speaks to Nurse Filippyevna in her room (which in itself lasts almost 30 minutes in total), would have downsized the running time significantly, and made for a better overall experience for the audience. Though it's a minor thing, I think the subtitles screen should have been lowered a touch: bear in mind that the vast majority of the audience will be reading them, meaning that they would have to bob their heads up and down many, many times during the production. Having the screen a touch lower would have made this a bit easier without compromising the show itself. Otherwise, though, the WNO team treated the audience to a strong portrayal of one of Tchaikovsky's best and most-loved works. For those that really have a passion for opera, they will have come away from here feeling mighty pleased, but even those who are new to one of the longest-running forms of art and culture in British society will appreciate the effort and the talent on display in this thoroughly enjoyable retelling of a classic story.